When I first received the Warhammer Historical Gladiator book (now out of print), I was blown away by the sheer amount of information and ideas it contained. I played a few games, but soon found that the one on one gladiator fights were not to my liking, but with a thought that perhaps using the rules for the large "mock battles" in the arena might be where the rules work best. It has taken many years, but I finally have got around to it. I have noticed that online, many people have tended to put their own tweaks into the rules, and with this, I haven't been an exception. A fan of hexes, I planned the battle on a hexsheet, and treated a 1 pace movement in the rules as a 1 hex movement. The sides play out in an IGOUGO format, so I though a "reaction" type system could be used where figures could react to enemy, and move out of sequence, by rolling equal to or lower than their Constantia (morale). A common tweak is also adding Disciplina to the "who won the fight roll, to reward better fighters. There were a few other tweaks, such as shooting being part of the movement phase, but probably a little too much detail for now. So last friday night at the Sutherland Shire Gamers meeting I tried scenario VIII "Attack on a Celtic Village" with Martin. The idea is, for the purposes of roman entertainment, a bunch of condemned noxii (slaves, prisoners of war, criminals etc) are dressed in Gallic clothing and some weaponry, and thrown against veteran gladiators with legionary armour and weapons. The numbers in the scenario were reduced but the proportions remained the same. 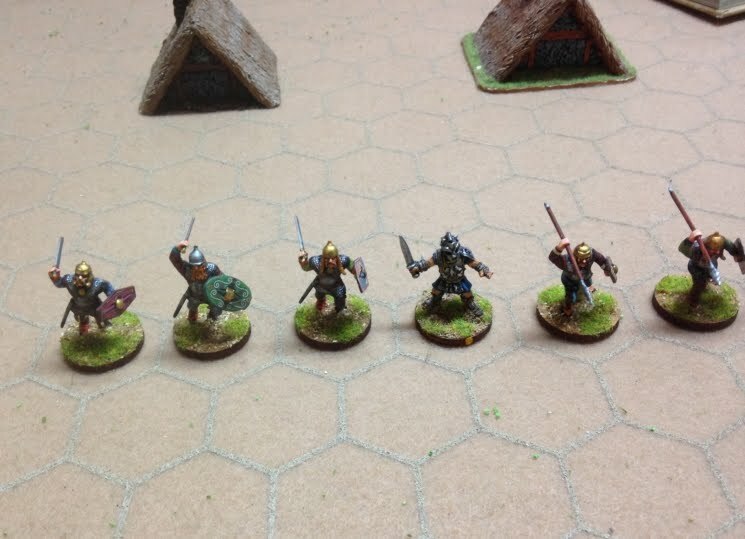 The 8 legionaries had the following stats D:3/4, F:4, P:7 (including +2 for the scutum), A: 1, W: 2, C:5. Of the 12 gauls, 6 were armoured; D: 3, F: 4, P: 5 (including +1 for the parma), A:1, W: 1, C:3, and 6 unamoured; D: 3, F: 3, P: 4 (including +1 for the parma), A:1, W: 1, C:3. There were 5 burning buildings to the rear of the gallic lines (as opposed to the 1 in the book). 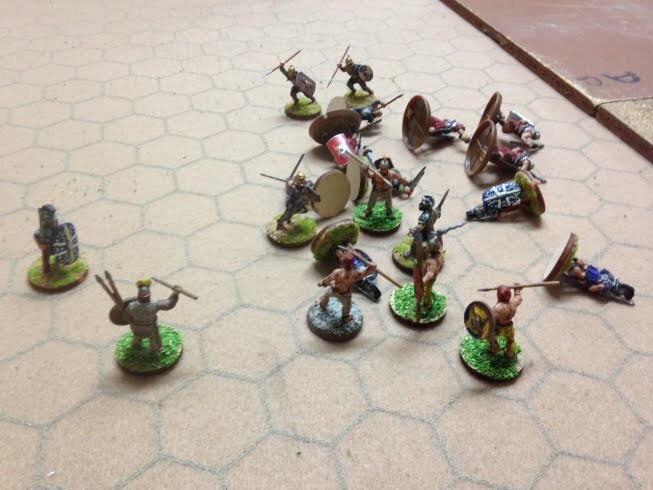 The first game ended the way is was meant to, with a complete victory to the Romans - 3 of the 8 roman figures suffered one wound, but all the celts were defeated. The initial pilum volley was quite important as it evened up the numbers for the battle. 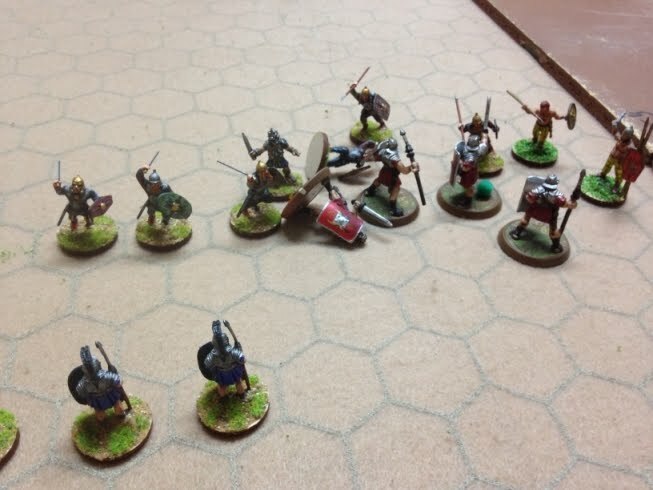 Then we tried a second time, this time replacing an unarmoured celt with a "maximus" figure (pictured to the left) , who was boosted with stats for a primus palus: D: 5, F: 5, P: 4, A:1, W:2, C:5, Cv: 3. He was also given the two special attacking moves - "Salmon Leap" and "Gea Bolg". To the right is the result of the first combat round. Maximus had an immediate impact - using one of his Cv points he did a "Salmon Leap" and hit, causing 2 wounds to the legionary. Elsewhere, one gaul fell as the romans did not find it easy this time. The superior number of celts started to have an effect - they were able to move behind the legionaries to cut off their "back off" path, giving extra attack bonuses to the celts. This was the situation towards the end. Overall, all 8 romans had fallen, and only 3 celts, a complete turnaround. Maximus was a major part in this (accounting for at least 4 casualties), but also the Romans were very unlucky with dice in the second game. Maximus was helped a lot by the tweak that adds Disciplina to the who won the fight roll. The Warhammer Gladiator rules worked well for a "big" battle. Unlike the one on one fights, the larger battles had some narrative to them. I think the addition of hexes made it easier to work things out by cutting out the need to measure the size of gaps or micromeasuring move distances. It was also interesting to see how the celtic side became different with a primus palus figure in their ranks - in the first game they needed to test morale in order to charge in, but if they were a near a primus palus, this was no longer the case, being able to automatically charge in and surround. Overall, the second game captured a bit of hollywood feel. Worked quite well, would like to try again without Russel as now I understand the rules and have the more mobile Gauls I may be able to strike down at least one roman.